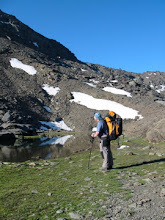 We usually like to make up our own walks, taking in new and interesting terrain mixed with testing navigation. Something that is not usually written up in books and followed by the crowd. The Marsden – Edale though written up is more of a concept than a route. There is no official route! Wessenden Valley Marsden to Edale. “The most famous moorland traverse of all” as described by Byne and Sutton in their excellent book “High Peak” (1966 now out of print). This 25 mile walk traverses three high plateaus, Black Hill, Bleaklow and Kinder Scout and tackles the harshest terrain the Peak District has to offer. There is no official route to follow and there are many variations that can be taken according to conditions, fitness and navigational skill. The early popularity of the walk (1920’s and 1930’s) was due to the fact that both Marsden and Edale can be reached by train, which was especially important in the historical context to Peakland walking with its then popularity mainly in the working classes. The walk is originally attributed to Cecil Dawson and Ross Evans at the beginning of the 20th Century. Dawson was a particularly strong walker who inspired a generation with his long distance walking exploits. His large group of friends or followers, “Dawson’s Crowd” became known as the 94th with Dawson as their Colonel. They took to wearing gymshoes to move faster giving a competitive edge to their walks. In 1925 members of the newly formed Bogtrotters Club completed the double, Marsden, Edale and back again. Alf Bridge, besides being a top climber was also a top bogtrotter and was elected President of the Bogtrotters in 1927, the year he completed the Marsden – Edale in around 4 hours. With the growth in Peakland walking during the depression years of the 1920’s and 1930’s the Marsden to Edale became the “yardstick” by which every strong walker measured themselves. The course has now become a fixture on the fell running calendar and the current record set in 2000 stands at an unbelievable 2 hours and 45 minutes! To my knowledge there have been 3 deaths, of people undertaking a "challenge walk" caught in a blizzard descending from Bleaklow. 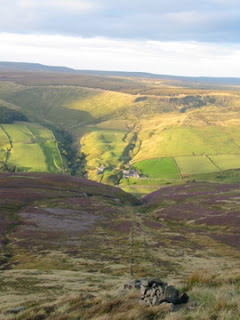 Our recent stroll from Marsden to Edale took 12 hours in pleasant summer conditions on August Bank Holiday Monday …………….. 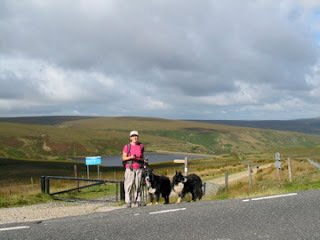 The walk leaves Marsden by Binn Road which leads into the Wessenden Valley. The valley is followed along an easy track besides the reservoirs. 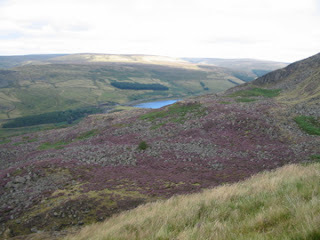 (It should be noted that some people prefer to walk the moorland above and on the western side of the reservoirs, Great Butterly Hill and White Moss, though this is rougher underfoot). 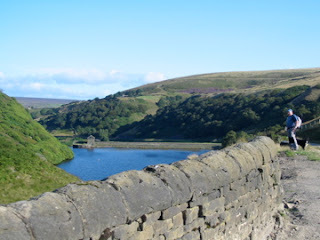 From the 4th reservoir (Wessenden Head Res. ), another broad track is reached which leads up to the B road a short distance from the A635. At the road junction with the A 635 we have reached 451m, a height gain of 218m in 5.5Km. So far it has been easy going and quite painless. West along the A635 for 200m brings us to a footpath signposted Black Hill. Unbelievably the path is paved nearly all the way to Black Hill. No navigation skills required yet! At Black Hill a decision has to be made, whether to head south on less well defined ground to Tooleyshaw Moor, White Low and Hey Edge to descend to the A628 by the chapel near Woodhead Dam; or to follow the Pennine Way to Crowden, a little further but on defined paths so the map and compass can stay in the rucksack. It had been a wet summer so we chose the latter. 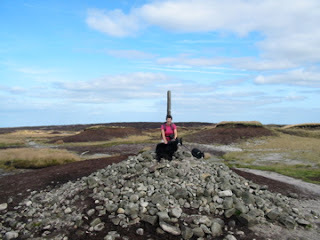 Prior to Black Hill we had seen only 2 other walkers, both on the section between the A635 and Black Hill. 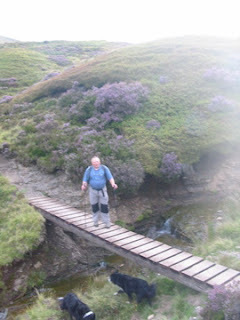 After joining the Pennine Way, we must have passed over 50 walkers heading north from Crowden to Black Hill. 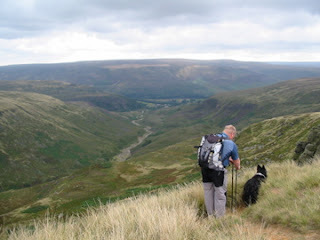 I’m sure that if we had taken the more direct route we would not have met anyone until near Crowden. We ended up having several lengthy conversations with people attempting the Pennine Way, all very sociable but a hindrance with time limited and so far still to go. From near the old YHA at Crowden we turned east along the A628. In a few yards there is a concessionary path that leads down into the valley and across the river just beneath Woodhead Dam. The path leads up to the B6105 and a gate opposite up onto The Longdendale Trail. It used to be possible to cross onto the moor near here and traverse diagonally up towards Wildboar Clough, however there is now a shooting club between the trail and the moorland of Bleaklow. We had been able to hear the shooting all the way from Black Hill and the various huts and bunkers built by the shooting club could be seen littering the North side of Bleaklow from before we passed over Laddow Rocks. Our detour west along the Longdendale trail looking for an access point was turning to despair when we came across a signpost to Wildboar Clough. Excellent. The path upwards is not well defined and eventually leads into the interesting section of Wildboar Clough. Those who want to scramble can stick to the clough (also a good ice climb in the right conditions) though with our dogs we chose to stick to the fence bounding the western side of the Clough. The clough levels out and is followed through open moorland to the summit of Bleaklow Head at 623m? In good conditions, crossing Bleaklow this way presents no real problem. It is however a different proposition when the mist is down or when there is snow on the ground. Leaving the summit we followed the Pennine Way southwards to Hern Clough. Once again we started to meet people. Where the Pennine Way changes from a southerly direction towards the south west heading for Snake Summit, we cut across open moorland towards the shooting cabin in Upper North Grain (near the rain gauge marked on the map). Some Marsden – Edale travellers may wish to continue to Snake Summit and either follow the Pennine Way to Edale (longer) or cross Featherbed Top, Ashop Clough, Fairbrook Naze and across the centre of Kinder to the top of Grindsbrook Clough (as described in the excellent book, The Big Walks by Ken Wilson and Richard Gilbert 1980). Our path on was through Lady Clough Forrest on a path running parallel to the (A57) Snake Pass. Neither of us had walked this section before and although tame compared to the open moorland, gave pleasant relief to aching feet as we trogged over deep pine needles. Could we pass the Snake Inn without stopping? No we couldn’t. Another path from near the Inn leads to the access point at the bottom of Fair Brook. 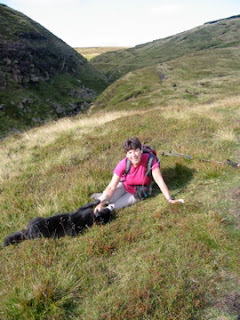 We crossed Fair Brook and took the diagonal ascending path into Gate Side Clough. A final steep pull up beside the ruined wall saw us onto the Kinder Plateau. We really were on the home stretch now. The compass proved right as always and bought us safely across the 1.5Km of Kinder Scout to the top of Grindsbrook Clough. Time was getting on and we were tired. Jane had thought to bring a torch, I had not. We were now moving as quickly as possible to avoid getting down after dark. We watched the moon rise and were thankful that it was full. The last section to Edale is on stone flags which although are a good job for preventing erosion, were murder on our aching feet. We entered Edale in twilight, 12 hours after we had set out. Could we have completed the walk quicker? Maybe. We had stopped for several conversations with fellow travellers: an old boy who had done the Marsden - Edale a few times in his younger days but was now thankful to be able to ascend Black Hill from the nearest road; a lone woman walking back up to Scotland along the Pennine Way after being refused a flight out of Liverpool for Ireland where she was planning to walk because she was told she could not take her stove on the plane. This despite the fact she had flown down from Inverness to Liverpool; We had a leisurely lunch and look around the new hostel at Crowden. What a pity that the café at the old hostel has not moved to the new one; A lengthy picnic tea was had in Upper North Grain and we failed the temptation test at The Snake Inn. 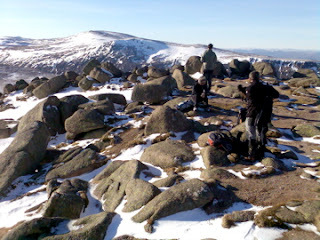 The walk proved to be as challenging as its reputation demanding good navigation, hill skills and stamina. Sheer Class. 1. Plan your route well. Do not take it for granted that distances, times or compass bearings written in guidebooks are correct. 2. Create your own route card. Work out your waypoints and compass bearings in advance so you don’t have to hang around in high winds, rain or snow. 3. 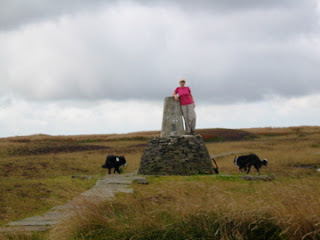 If you are not used to moorland walking or moorland navigation, get some practice routes in. 4. Carry the right clothing, food, drink and equipment for your intended route and for the time of year. 5. You must have confidence that you can cross rough open moorland in poor visibility or in the dark. Remember people have died attempting the Marsden – Edale.